I was extremely happy to arrive home to a shoe box parcel 9 days prior to the Pirin Ultra 67km 4000m sky race. The last race in the skyrunning extra category and the first time a World Series race was in the Bulgarian mountains. In the box were a pair of VJ Extrem shoes. I was excited to give these shoes a trial because the VJ Irocks2 have become a favourite of mine for running and racing short races in the UK and were my shoe of choice for the Glencoe Skyline in September. The Irock2’s are light, fairly narrow fitting and with minimalist cushioning for fantastic feel. The incredibly tough kevlar uppers have outlasted the grip, I could quite easily get them resoled for round two. The grip was brilliant for soft ground with deep lugs making sure my feet did not slip from underneath, the grip did not stop there. The sticky rubber used in the sole of these shoes is really magnetic to rocks giving me the confidence to really trust my foot placements. The grip in these shoes really helps me to run down hill fast with supreme confidence. The downside which makes these shoes good for short and fast fell racing is their minimalist nature with little cushioning for those long runs in the hill. The good news about the Xtrem , apart from the extreme colour scheme, when I pulled them out of the box was the same world class grip with sticky rubber. The key differences are the wider toe box, not to the extent of an Altra shoe but enough to allow your foot to splay. There was also a little more cushioning, not in the same league as Hoka’s, enough to give your foot some rest from the pounding but not enough to lose feel for the terrain under my feet. When I slipped my feet into the shoes I knew they were just the shoe for a nine hour sky race in Bulgaria. Keen to test out any new shoe before a race I decided to trial them on Leg 2 of the Bob Graham Round from Threlkeld to Dunmail. A long but easy run and these shoes had passed their first test. 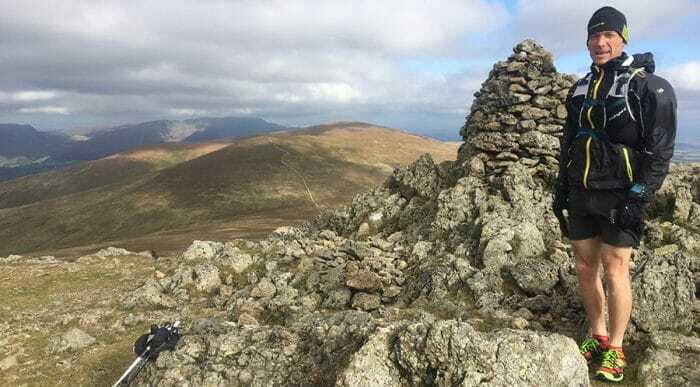 The next test was a hard and fast run up Bowscale Fell, 500m ascent 8km, in the dark. They were comfy and the grip was reassuringly good. These were coming to Bulgaria for a true road test. On the morning of the event I laced up the shoes knowing my feet would be safe in these. With no knowledge of the course except there was 67 km to cover and 4000m of mountains to climb and descend, going all the way up to 2600m three times. It was reassuring to see Andre Jonsson, second place in two sky running races in Glencoe, wearing a pair too. The first 12 km was mainly an uphill run on tracks or good trails , I was thinking a more cusioned trail shoe with less aggressive grip would of been more appropriate. This was a sky race, so once past the first aid station we were on to alpine terrain with some trails, alpine meadows, boulder fields, pathless mountain tops, ridge line running and technical descents through forests. My key thought when hopping from boulder to boulder was I could really trust the grip and the shoes felt an extension of my feet thus not too bulky. However after running for eight hours on hard ground after a long Bulgarian summer and finally hitting the ski piste for the last 8km into Bansko my feet did feel tired from all the impact. These shoes were a good compromise retaining the quality grip, extra cushioning without losing the feel needed for good propriception and the wider toe box to allow your forefoot to naturally spread. Most importantly they felt light and fast. They would be even better suited for a long fell race in the UK such as Langdale Horseshoe, Borrowdale or the Montane Goat. They will be my preferred shoe for long mountain runs this Autumn/ Winter in the wetter Lake District.